A crown could be a good solution for you if you have some discoloured fillings and would like to improve their appearance, although often private white fillings can be a useful solution and are less destructive to the remaining tooth tissue. Molar teeth which have had a root canal treatment are significantly more prone to fracture if they are not protected from the forces of the opposing teeth. 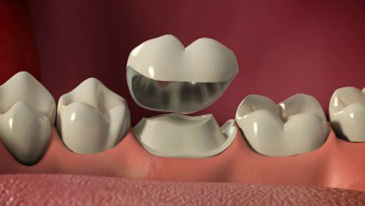 Crowns are often recommended in these cases to restore the tooth, allowing you to eat and bite down on it as if it was a real tooth. Natural-looking restoration. Functions like a real tooth, so you can bite and chew as usual. The NHS provides tooth coloured crowns on front teeth (up to the premolar tooth), and metal crowns of back teeth (e.g. molars) when clinically required. However we do offer this privately. When producing private crowns it is also possible to attend the lab for a shade match (a charge is applicable for this). This enables the lab to construct a crown in the closest possible shade to your adjacent teeth, as opposed to using a 'stock shade guide' and often enables features such as white flecks, cracks, markings to be incorporated into the crown to further improve its aesthetic comparison to the adjacent teeth. 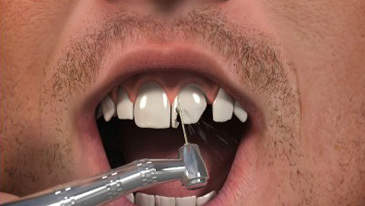 Discuss with your dentist your desires and they will discuss the available options to best suit your needs.